Silica nanospheres and microspheres in monodisperse and polydisperse grades are offered as a free-flowing white powder and have an exceptional degree of roundness: >99%. Also known as Silicon Dioxide (chemical formula of SiO2), silica monodisperse nanospheres and microspheres are offered in sizes ranging from ~160nanometers to ~10micron with CV<10%. Polydisperse grades of silica microspheres offer a more economical option with D50=4-8micron and can be purchased with an optional dimethylpolysiloxane coating, which provides good dispersion and additional resistance to acids, alkalies, UV and moisture. Silica microspheres are inherently hydrophillic and negatively charged. These particles provide higher opacity than glass microspheres and are often used as contrast particles. Aqueous suspensions of silica microspheres rarely require the use of surfactants or stabilizers. Silane coatings enable silica microspheres to be modified to generate functional groups or alter surface properties. Additional advantage of silica microspheres is glass transition temperature of over 1000 degrees Celsius, which makes them suitable for high temperature applications. 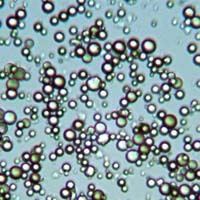 Silica microspheres and nanospheres are composed of synthetic amorphous silica made in a laboratory batch environment. See link for examples of research done with our silica microspheres. 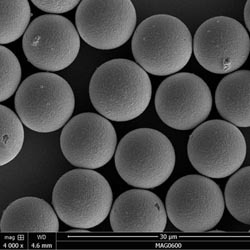 Silica nanospheres and microspheres in monodisperse and polydisperse grades are offered as a free-flowing white powder and have an exceptional degree of roundness. Glass transition temperature of over 1000 degrees Celsius. Silicone-based coating on silica microspheres makes the spheres hydrophobic, easy to disperse, resistant to acids, alkalis, UV and moisture. Silver coating on silica spheres offers electrical conductivity and reflectivity of silver.